Կալլագենը մեկնաբանել է Մերֆիի օրենքը` ասելով. Ավելի ուշ Կալլագենի մեկնաբանությունը վերաձևակերպվել է ավելի խիստ ձևով. ↑ 1,0 1,1 Артур Блох. Закон Мерфи. — Минск: Попурри, 2005. — 224 с.
Nick T. Spark (2006-05-21). 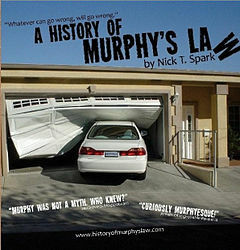 A History of Murphy's Law. Periscope Film. ISBN 0-9786388-9-1. Paul Dickson (1981-05-18). "Murphy's law". The Official Rules. Arrow Books. pp. 128–137. ISBN 0-09-926490-0. Klipstein, D. L. (August 1967). "The Contributions of Edsel Murphy to the Understanding of the Behaviour of Inanimate Objects". EEE Magazine. 15. Chatterjee, Atanu. "Is the statement of Murphy's Law valid?". Complexity. doi:10.1002/cplx.21697. - Is the statement of Murphy's Law valid? David J. Hand, The Improbability Principle: Why Coincidences, Miracles, and Rare Events Happen Every Day, Macmillan, 2014 ISBN 0374711399. Richard Dawkins, The Magic of Reality: How We Know What's Really True, Simon and Schuster, 2012 ISBN 1451690134.